1. Place the noodles in a large bowl and cover with boiling water, leave for 5 minutes then drain. 2. Add the carrot, prawns, salad onions and coriander leaves to the noodles. 3. 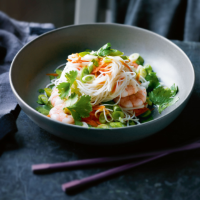 Whisk together the lime juice, soy sauce and fish sauce and mix into the noodle salad. Serve in large bowls with chopsticks.